The Congress party’s misadventure on the Uttar Pradesh front and the upcoming elections in this crucial state will cast a long shadow over the budget session of Parliament commencing tomorrow. An important question arising out of the Godhra train carnage case pertaining to the applicability of POTA review committee’s findings in the pending cases already under trial was referred by the Supreme Court to a larger Bench today. Despite the poll schedule for the state being announced, Uttar Pradesh Chief Minister Mulayam Singh Yadav is determined to go ahead and prove his majority on the floor of the House on February 26, apparently in a bid to quell speculations about the legal status of his government. The key accused in the Jessica murder case, Manu Sharma, today moved an application for bail in the Supreme Court along with his appeal against the conviction and award of life sentence by the Delhi High Court. Fifteen bombs were today found in suitcases abandoned in a coach of the Sealdah-Varanasi Express train near Dhanauri station during intensified searches of trains in the aftermath of the Samjhauta Express blasts. The Cabinet today approved the Senior Citizens Bill, which provides for imprisonment to children for neglecting their aged parents. Known as mini-Punjab, Udhamsinghnagar district of Uttarakhand, registered the maximum turnout of voters among all districts of the state in the Assembly election held yesterday. Grief-stricken relatives of Pakistani girl Ayesha, missing since Sunday’s blasts in the Samjhauta Express, were compelled to call off the search for her after spotting her scorched schoolbag with half-burnt textbooks in a gutted compartment of the train. The Telugu Desam Party has demanded that Prime Minister Manmohan Singh should intervene to stop the raids against Eenadu Group and restrain Chief Minister Y.S. 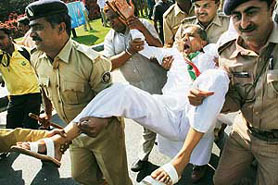 Rajasekhara Reddy from assaulting the freedom of the press in Andhra Pradesh. In what appeared to be a move of wide political ramifications, the LJP leader and a leading partner of the UPA, Union Steel, Fertiliser and Chemical Minister Ramvilas Paswan today shared a common dias with Bihar Chief Minister Nitish Kumar to uphold the cause of state’s development. Protests by small traders and several left-wing organisations against the entry of Wal-mart into India turned out to be a damp squib, with only a handful of demonstrators making it to the venue in South Mumbai. A day after the announcement of the Assembly election schedule in Uttar Pradesh, Union Home Minister Shivraj Patil today met President A.P.J. Abdul Kalam. Eminent scientist R.A. Mashelkar was today at the centre of a controversy after admitting that the report on patent law by a committee headed by him plagiarised material, which has prompted CPM to ask the government to discard it. The Maharashtra Government has decided to deploy Unmanned Aerial Vehicles or pilot-less aircraft fitted with sophisticated night-vision cameras to track down and kill Naxalites operating in the state’s Gadchiroli district. Railway Minister Lalu Prasad Yadav has indicated that more fully air-conditioned Garib Rath trains would be introduced in the next fiscal. Water’ to hit screens in India soon. Already under attack on the twin issues of price rise and national security, the UPA government will come under fresh strain in the light of its souring relations with the Left parties and the Samajwadi Party who joined hands to oppose its attempts to dismiss the Mulayam Singh Yadav government. The election results in Punjab, Uttarakhand and Manipur, where the Congress is widely expected to fare poorly, will only add to its unease. With elections in Uttar Pradesh having been announced, the budget session will witness a high-decibel drama as all major political players from the state will use the floor to show the Congress-led UPA government to position themselves for the crucial Assembly polls. Aware of the tough time it could face, Congress president Sonia Gandhi also held consultations with senior ministers and party leaders to draw up a strategy for the session. The seven-phase UP poll beginning on April 7 will prompt some changes in the schedule of the budget session of Parliament as many parties will be involved in the campaigning. This issue figured at the customary session-eve all-party meeting called by Lok Sabha Speaker Somnath Chatterjee today where parliamentary affairs minister Priyaranjan Dasmunsi was deputed to draw up a fresh schedule in consultation with the political parties. The new dates will be discussed and finalised at the business advisory committee meeting on February 26, Dasmunsi later told mediapersons. As per the current schedule, the first phase of the session is to end on March 21 followed by a recess up to April 18, while the second phase will continue till May 22. Mr Dasmunsi said that though the session will accord priority to financial business, issues like price rise, recent blasts on the Samjhauta Express and FDI in retail will also be slated for discussion as being demanded by the members. After the President’s address to the joint sitting of Parliament tomorrow, the rail budget will be presented on February 26, followed by the tabling of the Economic Survey and the general budget on February 28. Mr Dasmunsi, who held a meeting today with senior officials to finalise the legislative business for the session, said that the Communal Violence (Prevention, Control and Rehabilitation of victims) Bill is among the important Bills listed for passage. He, however, parried all questions about the pension reforms Bill, which has been awaiting passage for the last two sessions as it has met with strong disapproval from the Left parties. The issue was brought before the apex court by Godhra train carnage case’s main accused Mahmadhusen Abdulrahim Kalota while moving a bail application after the Gujarat High Court had refused the same to him and 125 other accused, rejecting the findings of the POTA review committee that no case of terrorism was made against them. A Bench of Mr Justice B.P. Singh and Mr Justice H.S. Bedi though said the court would consider the bail applications on merit but it referred to a larger Bench for decision the question of law whether the review panel’s recommendations were binding on the prosecution and trial courts in the pending cases. The provision of the review committee for screening the cases registered under POTA was made by Parliament while repealing the Act itself. The UPA government had repealed POTA enacted by the previous NDA regime for reasons that it was widely misused. To ensure proper applicability of POTA even in the cases registered during the period when it was in force, an amendment was introduced to Section 60 by the UPA government making the provision for the review committee whose recommendations would be binding on the government and the investigating agencies. The Gujarat government had taken a stand in the High Court that the introduction of such a mandatory provision in an Act when it was being repealed was not constitutionally valid because when the legislation was repealed there was no need for inserting such a binding provisions in it. The Gujarat government had also said the Supreme Court in Raja Bhaiya case and the Madras High Court in Vaiko’s case had clearly laid down that the role of the review committee in pending POTA cases was “very limited” after the trial court had taken cognisance of the chargesheets and was of the “prima facie” view that a case under the Act was made against the accused persons. Addressing a massive ‘Pasi Maha Sammelan’ at the historic Maharaja Bijli Pasi Fort on the outskirts of the state capital today, Mr Yadav spoke of all parties acting against his government and jointly hatching conspiracies even after poll dates have been declared. “Pata nahi humse kya ghalti hui hai” (I don’t understand what wrong I have committed), he wondered aloud. According to political observers, the strategic move to carry on with his earlier schedule of proving his majority on the floor of the House was calculated to bring manifold results for the Samajwadi Party. The CM wants to prove that he still had the crucial numbers inside the House. This was meant to further irritate the BSP and force them to repeat in a much shriller tone their demand for the dismissal of his government in the wake of the Supreme Court judgement. Consequently, a political scenario can emerge where the Congress could be completely cornered on the one hand by the BSP for not dismissing the Samajwadi Party government and on the other by its UPA partners if it decides to indeed go ahead. Insiders also point out that Mr Yadav would not miss any opportunity to fuel an apparent division within the UPA on the question of the dismissal of his government. In the absence of any clear-cut election issue, the Samajwadi Party leader would like to use his Congress-BJP proximity theory of conspiring to dismiss his government as a convenient poll plank to garner Muslims votes. Meanwhile, the BSP has submitted a memorandum to Speaker Mata Prasad Pandey along with a copy of the Supreme Court judgement of February 14. While declining to take any action against the 24 remaining former BSP MLAs the Speaker had pleaded that he would decide only after he received a copy of the judgement. In the memo, the BSP has requested the Speaker to immediately publish the latest party position in the light of the judgement. According to BSP sources, they want to know that if the 24 MLAs are not disqualified, which party would they represent. Logically if they are not disqualified and the split has not been recognised, they should be shown as BSP MLAs, argued a party insider. While seeking stay on the sentence, his lawyer, P.H. Parik, made special mention of filing of the bail application, before a Bench headed by Justice Arijit Pasayat. Since the matter was just mentioned, the Court said the appeal as well as the bail application would be listed before an appropriate Bench for detailed hearing. Manu in his petition said he had a “strong case for acquittal’. The police said passengers travelling in coach number 95411 noticed two abandoned suitcases near the toilet and immediately informed Government Railway Police and railway officials. After breaking open the suitcases, five powerful and 10 small crude bombs and materials used for making them were found in one suitcase. The Cabinet today approved the Senior Citizens Bill, which provides for imprisonment to children for neglecting their aged parents. The Bill, called the Maintenance and Welfare of Parents and Senior Citizens Bill 2006, will be introduced in the Budget session of Parliament. The Bill is directed towards making it compulsory for children to care for their aged parents above 60 years. It seeks to provide effective care and protection to senior citizens and will provide speedy and inexpensive legal framework to grant maintenance to senior citizens. The Bill also seeks to set up tribunals at the district level, having wide ranging powers, to provide need-based maintenance to senior citizens. Under the provisions of the Bill, if a person, who is responsible for care of his parents, failed to do so, he can attract punitive measures like three months’ imprisonment and a fine of Rs 5,000. Besides, it also provides for option to revoke the will. A meeting of the Union Cabinet, chaired by Prime Minister Manmohan Singh, gave its approval to the measure. Under the provisions of the Bill, anyone could complain to the tribunals seeking relief for the senior citizens. The measure also provides for setting up of old age homes, better medical facilities, protection to life and property of senior citizens and sensitise police forces regarding their security. The Cabinet also cleared the Foreign Education Providers (FEP) Bill, which would allow the entry of foreign universities in the country with some restrictions. As per the proposed Bill, all foreign universities would get a status of deemed universities, thereby bringing them under the ambit of University Grants Commission regulations. The Bill on FEPs entails tough regulation, including a corpus of Rs 10 crore and the certificate of validation of the foreign university from Embassy or High Commission in India. Of the corpus fund, 75 per cent would be used for developing the institute and the remaining 25 per cent would be deposited in the corpus fund. The Bill has stringent clauses to regulate the standard of educational institutions and prevent the entry of fly by night operators. The Bill was introduced in the Cabinet in July 2006 but was referred to a Group of Ministers following reservations expressed by the commerce ministry over various clauses in the Bill. However, the differences were sorted out with the GoM adopting a middle path. In its recommendations submitted to the HRD ministry in December, the GoM suggested the constitution of a committee to examine all FEP cases and decide on the exemptions to be given to them. The exemptions would be applicable to only top institutes like Harvard or Oxford, a government official said, without ruling out the possibility that reservation for weaker section may not be applicable to these institutes. The higher turnout of the district is in line with the overall poll turnout pattern of the state. Compared to the 54.43 per cent turnout in the Assembly election of 2002, the official figure stands at 61.83 this time. The percentage is expected to increase further as the EVMs from the polling stations in several remote areas of the hill state are yet to reach their respective district election offices. Officially, the poll percentage of six Assembly segments of Udhamsinghnagar district was 71.7 excluding the Bazpur segment for which election was countermanded due to the death of Congress candidate Janak Raj Sharma in a road accident. The overall percentage of the district is set to increase after polling in this segment, which is scheduled to take place on March 25. Uttarakhand CEO N. Ravishanker informed that most of the EVMs had reached the district headquarters concerned. But the exact poll percentage of the state would be known after receiving the polling parties from all remote areas of Pithoragarh, Uttarkashi and Chamoli districts located along the international border with Tibet. The polling parties from these districts are expected to reach by late evening on February 23. As per district election officer, Pithoragarh, the polling party from the highest polling station Namik situated at the height of 9000 ft reached the district headquarters at Didihat this afternoon after being airlifted in a helicopter of the IAF. But another party from the Ganghar polling station in the Purola constituency is expected to reach its destination in Uttarkashi district by tomorrow evening after covering a distance of 165 km in bus. “She had brought her books to India saying she did not want to waste a moment in preparing for the matriculation exams she would sit for on returning to Pakistan,” Ayesha’s uncle Rana Liaqat Ali Khan from Pakistan’s Faisalabad said today at the Safdarjung Hospital, where the girl’s parents and a sister are admitted to the intensive care unit. The family had been caught between despair and hope since Sunday as the authorities in Panipat had initially said 15-year-old Ayesha survived the devastating fire on the train that claimed the lives of four of her siblings. But a search in Panipat led to some charred human remains that Liaqat could not identify, a burnt schoolbag with Ayesha’s books and confirmation from some fellow passengers that they had seen Ayesha burn to death with her siblings. Speaking to reporters at his party office, TDP chief N. Chandrababu Naidu said his party would raise the issue in Parliament and submit memoranda to the President and the Prime Minister against state government's vindictive actions against critical press. Stressing that the CID searches against Margadarsi Financiers were clearly linked to Eenadu's anti-government writings, Naidu said the Chief Minister initially tried to intimidate the management by spewing venom against the newspaper group publicly and provoking his party men against the newspaper. He alleged that the Chief Minister, who had a factional background, conspired to destroy the group by crippling Margadarsi financially so that it would default on payments. "When it is the Reserve Bank of India which has to take any action on Margadarsi, what is the need for the state government to create a special authority to hunt the finance company? Reddy wants to create panic among the depositors and financially ruin the group," Naidu said. Accusing the Chief Minister of violating at least seven laws in possessing thousands of acres of government land, Naidu said while the government brought a new law to protect Reddy, it was initiating criminal proceedings against a company that had an outstanding record in payments. The programme was linked to the announcement of around Rs 5,000 crore of development packages for Hajipur and Vaishali primarily targeting Paswan’s Lok Sabha segment. Eulogising Nitish as a “revolutionary Chief Minister,” Mr Paswan surprised all by promising to walk an extra mile beyond politics to share the hands of Nitish to usher in a new chapter of development for Bihar. “Come what may: I am with Nitish so far Bihar’s development is concerned”, he said. Nitish too reciprocated the gestures shown by Ramvilas by heaping praise on him as a man committed to development beyond “mean” politics. Worse still, the handful of protesters who made it to the venue today indicated that all was not well with the coordination committee set up to oppose the US retail giant. “There are many internal disputes among wholesalers, distributors and small kirana shop keepers which prevents us from putting up a common front,” one of the organisers told The Tribune at the venue. The joint action committee is being spearheaded by the Shiv Sena politician Mohan Gurnani, who has been trying to bring together retailers on a single platform for long. “Wal-Mart is entering India through the backdoor (via its agreement with Bharati),” Gurnani said. He said the retail giant would implement the same practices in India which put thousands of small mom and pop stores out of business in the USA and other countries. The JAC said it was also opposed to the entry of Reliance and chain stores like Subhiksha into the small format store business. The traders are now using a study conducted by local academicians in Mumbai. The study, conducted by researchers of Jai Hind College within 1-km radius of two shopping malls in the city, indicated that 71 per cent of small businesses reported a decline in sales. “The hardest hit were the small grocery shops and even small roadside hawkers,” the study said. Among those who came out to protest today ironically included representatives of small-chain stores operating for long in Mumbai. “Customers should not expect lower prices for long. Once the small stores shut down and when six or seven big players remain you will see prices going up,” Mahesh Kambli, CEO, Apna Bazar, said. This chain has for long been trying to popularise lower prices among Mumbai’s housewives. Wholesalers in the city also latched onto the protests in order to force the government to let them form large buying groups to negotiate better prices from MNC manufacturers. “If we can come together and buy in bulk, we can also give lower prices like the big chain stores,” said Ashok Vaykul, general secretary, Mumbai Wholesalers Federation. Mr Patil is understood to have briefed him about the recent attack on Samjhauta express and the situation in Uttar Pradesh. Inspector-General of Police Pankaj Gupta who is in charge of the Anti-Naxal Squad said the drones would provide photographs and visuals of the Naxalite dalams operating in the dense forests in real time. Commanders of battalions participating in anti-Naxal operations would directly visuals from the drones on to their laptops immediately thereby allowing them to react quickly to neutralise their targets. Speaking after flagging off the fourth Garib Rath from Hazrat Nizamuddin here, he said the backlog of vacancies would be filed in the Railways. The train, the regular service of which will commence from Bandra on Saturday and Hazrat Nizamuddin from Sunday, will run thrice a week.